anti-LIG1 抗体 (C-Term) | ABIN4305493 Product No. Western Blot: DNA Ligase I Antibody [NBP1-51968] - NBP1-51968 (0.1ug/ml) staining of HeLa nuclear lysate (35ug protein in RIPA buffer). Primary incubation was 1 hour. Detected by chemiluminescence. 免疫原 Peptide with sequence C-RVREDKQPEQATTS corresponding to internal region (near C-Terminus) according to NP_000225.1. 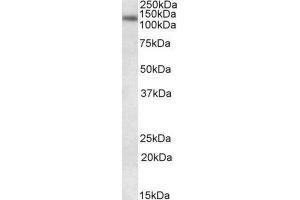 应用备注 Western Blot 0.1 - 0.3 μg/mL, Peptide ELISA Detection limit 1:16000WB: Approx. 125 kDa band observed in HeLa nuclear lysates (calculated MW of 102 kDa band according to NP_000225.1). 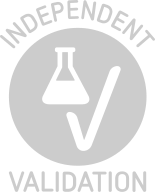 The observed molecular weight corresponds to earlier findings with different antibodies from other sources. 有引用在： Ferrari, Rossi, Arosio, Vindigni, Biamonti, Montecucco: "Cell cycle-dependent phosphorylation of human DNA ligase I at the cyclin-dependent kinase sites." in: The Journal of biological chemistry, Vol. 278, Issue 39, pp. 37761-7, 2003 (PubMed).